For the moment, we have put the best arguments in our first post. So we are just repeating it here, with a different picture, so as to keep it in view. We’ll improve on it in due course. 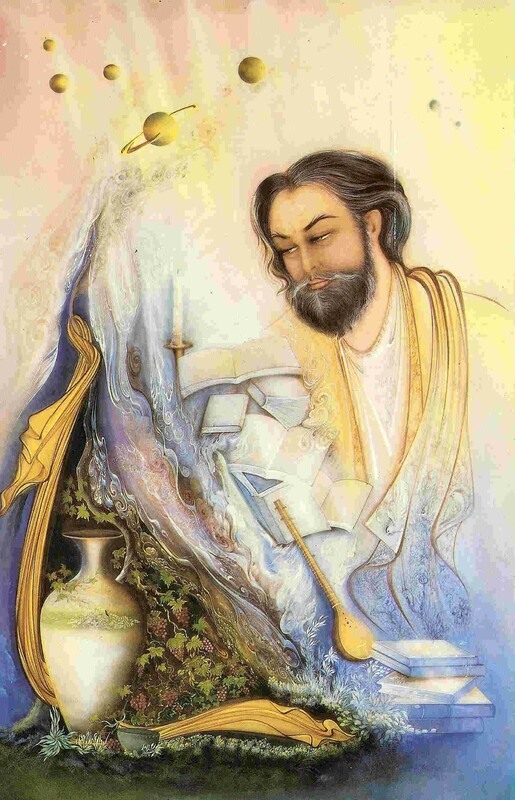 This blog is for everyone who loves the Rubaiyat of Omar Khayyam, and finds that it is still both fascinating and inspirational, over 900 years after it was first created in eastern Persia, and 150 years after Edward FitzGerald created his famous version of the poem in English. If you don’t have a clue what we are talking about, you may at this point want to check out our main website www.omarkhayyamrubaiyat.com which has lots of detail about the poem, its authors, and even a full text of FitzGerald’s first edition in English. For those who already know the poem, we are aiming to use this blog to help everyone keep up to date with new happenings relating to the Rubaiyat – books, art works, exhibitions, lectures, research, and much more. The year 2009 was a seminal point for Rubaiyat lovers, with so many happenings that marked the two anniversaries in that year. But more has happened since. And it would be great if we could create on on-going Rubaiyat community to which everyone can communicate their knowledge and thoughts. So if you have news or thoughts that you would like to share, please file comments on the blog, or contact us and we can do it for you. The more the merrier – at least at present! Let us have your suggestions. And sign up to receive blog notifications by e-mail so you know what is happening. I’am interested in the book you mention in the blog. Specially I should like to know who did the German translation, for I am just working too on a new translation strictly after Edward Fitzgerald. Unfortunately I couldn’t find any link to the translator in all the postings I could found. If you could give me an answewr, I should be much obliged! I uploaded a short while back a full reading and video of the Rubaiyat — – https://youtu.be/xdbNh4jZEM4. Whilst not pefect I believe it to be worthy – it is certainly gaining in popularity – your fellow enthusiasts may enjoy it – I hope so. Thanks for alerting us to your video, David. We have enjoyed dipping into the film and hope to view it in full shortly. We’ll put the essence of your comment on the site in a new post in the next few days, so the video gets more general attention. Congratulations on your work. Are there any remaining Omar Khayyam clubs or associations still in existence? I ask because my searches have only found dead, out-of-date. or broken websites. For example, the CONTACT button of the Omar Khayyam Club of London leads to an out-of-date URL, and none of the other websites I have found seem to be still active. Fitzgerald…he took a beautiful woman and painted her like a whore. If only you all knew how Fitzgerald ruined the soul of the Rubaiyat with his English pomposity. The wall between languages is a curse. If only you all could see the raw beauty of the man when he wrote lucidly, or when he wrote drunk, when he was filled with hope and when he could barely keep going. You could see all this, HEAR it in his words. Words that carry more significance and innovative ideas than people know without knowing what Omar Kayyham knew, truly knew. Fitzgerald failed to carry on that expression, he simply draped Kayyhams words with his Victorian frills. I saddened me for a long time that there were no other good English translations. Some from other languages kept loyal to Kayyham’s soul. The best way to read it however is in Persian. Not in translated Persian, but once you truly know the soul of the language. Or you’ll just have to wait until someone translates it and truly carries the soul of Kayyham over to English, rather than **** Fitzgerald did. Best known for corrupting one of the greatest minds that had graced this Earth. Hello, i wanted to know your opinion on why Mr. Fitzjerald used the word Lizard , in the quatraint about Jamshid’s court? My name is Mark Evans and i am an Assistant Librarian at the National Library of Wales in Aberystwyth, Ceredigion, Wales, UK. I am currently cataloguing ” An index to Ambrose George Potter’s Bibliography of the Rubaiyat of Omar Khayyam / compiled by Douglas Taylor”. To assist us with our author catalogue would it be possible for you to send us an e-mail address for Mr Douglas Taylor and/or Mr Bob Forrest so we can send a author enquiry form to them via an attachment?